Hubble's view of the Eagle Nebula's star-forming region is well known as the "Pillars of Creation." 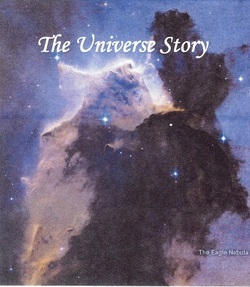 With recent scientific discoveries and the gift of the Hubble Telescope, a new view of the amazing evolutionary story of which we are a part is available to us. The entire cosmological unfolding from billions of years ago until the present moment is the astonishing and sacred event to which we have access. And the Divine Presence, God, is involved in all of it. Today, scientists and theologians are looking together at what the new cosmology, as it is called, reveals, and what it offers toward creating a future full of hope. Our gathering on the morning of October 22 might be called an interactive retreat experience. It will include a re-introduction to and ritual presentation of the Universe Story. We will explore how a deepening knowledge of this story and its implications can affect our view of God, creation, our planet and ourselves. While this amazing and sacred story may be familiar to many of you, it has the power to expand our consciousness each time we ponder it. Working together to foster peace & justice in our world, our church, and ourselves. Click for map and directions (Google Maps). Go 3/10 miles, church is on left. Clare Wagner, OP is a Dominican sister who has a background in literature and theology with a concentration in spirituality. Currently, the focus of her ministry is spiritual direction, retreat work and adult faith formation. Her experience includes teaching, administration, campus ministry and, recently, coordination of a spiritual guidance training program. Clare has been leading contemplative retreats for women for the past decade. A focus of her ministry and study is women’s spirituality; her passions are attentiveness to the universe, especially our small planet, and the needs of women around the globe. Clare is the author of Awakening to Prayer, a volume in the 2007-2010 series, Called to Holiness: A Women’s Perspective. "Everything which God Created millions of years ago and everything which will be created by God after millions of years – if the world endures that long – God is creating all that in the innermost and deepest realms of the human soul. Everything of the past and everything of the present and everything of the future God creates in the innermost realms of the soul." Register for this event by completing the two steps below. Send an email to calltoactionmadison@gmail.com for student rate or scholarship. Step 1. Select the appropriate item and by clicking "Add to Cart" below and following payment instructions. Return to this page to complete Step 2. Step 2. Complete the form below and click "Submit" to complete your registration. You can also send us a check to the address below. See the flyer above for more information.